Henley on Thames is a beautiful historic market town in South Oxfordshire situated on the River Thames between Reading and Maidenhead and close to the corners of the counties of Oxfordshire, Berkshire and Buckinghamshire. The town has many shops, cafes, pubs and restaurants to suit a variety of tastes and budgets. There is much to see and do in Henley such as beautiful walks, cycling, boat trips, boats for hire, and checking out its many historical features which includes the Temple on the Island which was built in 1771 as a summerhouse come fishing lodge for Fawley Court and is also the start of the Regatta course, the Town Hall a Victorian building which houses the information centre, St. Mary’s Church where there is a memorial to the singer Dusty Springfield, the Chantry House built in 1450 is the only Grade 1 listed building in Henley, Henley Bridge was built between 1776 and 1786 replacing the original 1170 wooden bridge that was damaged in the Civil War and was swept away in the floods of 1774. The Henley Royal Regatta headquarters opened by Her Majesty the Queen in April 1986 is on the right hand side of the bridge. 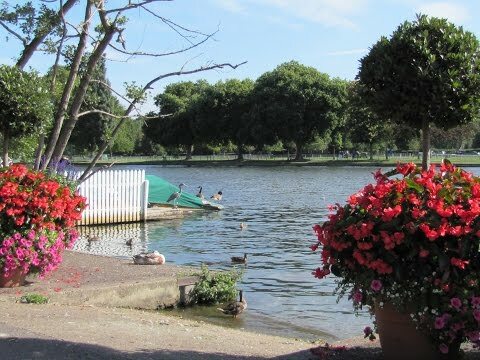 Henley is renowned Worldwide for its rowing centre and Henley Royal Regatta and Festival usually takes place over five days (Wednesday to Sunday) during the first two weeks in July on the long stretch of the river known as the Henley Reach. Henley Regatta was first held in 1839 and took place on a single afternoon but soon became popular with oarsmen that by 1840 racing lasted for two days. In 1851 the Regatta became Royal and Prince Albert became the patron. In 1886 the Regatta was extended to three days and to four in 1906 and as the Regatta became even more popular the event was extended to five days in 1986. Many other regattas and rowing races are also held on this stretch of the river such as the Henley Boat Races for women’s and lightweight teams between Oxford and Cambridge University. The Thames Path National Trail follows England’s best known river for 184 miles from Gloucestershire to the City of London and the county boundary runs through the middle of the river with Oxfordshire on one side and Berkshire on the other. Mill Meadows a large park area has an information centre, children’s playground, Mill Meadow Bandstand, Leichlingen Pavilion, Henley Bowling Club, River and Rowing Museum, Marsh Meadows Wildlife area and Trail. There has been a market in Henley since the 13th century selling grain and items brought up river from London as well as selling local products but today the market is very different and in the year 2000 the Market Place was pedestrianised. Friar Park is a 120 roomed mansion house built in 1899 as a weekend retreat for Sir Frank Crisp, an eccentric London lawyer. After his death in 1919 it was passed on to Roman Catholic Nuns who ran a local school in Henley but by the late 1960’s it became in a state of disrepair. Friar Park was bought in early 1970 by the Beatle’s musician George Harrison and his wife and son have continued to live there since his death in november2001. Henely Park is a country house and landscape garden about 1.5 miles north of Henley. The park was created in the 13th century as a medieval deer park of the Fawley Court Estate and Henley Park house was the dower house to Fawley Court. Middle Assendon is a small village in the Stoner Valley in an area of outstanding beauty on the edge of the Chiltern Hills. The village sits on the Chiltern Cycleway and the popular walking route the Oxfordshire Way. The village pub, the 17th century Rainbow Inn, is the perfect place to stop, take a rest and enjoy a meal. It is also a good start and end point for a ramble on the many footpaths of the Stonor Valley where many Red Kites can be seen. Bix is a small village in South Oxfordshire situated 2.5 miles northwest of Henley and remains of a Roman farmhouse were found during an excavation of the common in 1955, as well as later Saxon remains. St. James’ parish church in the village was completed in 1874 replacing the original small Norman church also dedicated to St. James’ that was situated about a mile away in Bix Bottom. The old church, now ruined and overgrown, was used for scenes in the 1971 film Blood on Satan’s Claw. Greys Court, open to the public, is a picturesque 16th century Tudor mansion house with a beautiful courtyard and gardens. The walled gardens are set amongst the medieval ruins of a previous castle and all that remains of the castle is a fortified tower. Also in the grounds is a rare Tudor wheelhouse where a donkey operated a treadmill to haul water from a well and was still in use until the early 20th century. The house was owned by the Brunner family and in 1969 they donated the estate to the National Trust and the family continued to live in the house until the death of Lady Brunner in 2003. The Oxfordshire Way is a long distance footpath running for 68 miles from Bourton-on-the-Water in Gloucestershire to Henley on Thames and links with the Heart of England Way and the Thames Path. It passes from the Cotswolds to the Chiltern Hills with hilly sections towards each end and gentler country in the middle sections. The Chiltern Way is a long distance circular footpath running for 172 miles through the Chiltern Hills and passing through parts of the counties of Bedfordshire, Buckinghamshire, Hertfordshire and Oxfordshire. We turn right out of Tilebarn Close car park and immediately left up a tarmac passage way, marked footpath, passing two buildings on the left and when the path turns to the left up some steps we ignore these and continue on a narrow over grown path on the right. We soon come to Paradise Road with a lodge gate to the collage on the left we carry on forward to the end of the road and turn left. At the next junction you come to Gravel Hill with the entrance to Friar Park opposite. We cross the road and turn immediately left following the sign on the wall to Hop Gardens Public Footpath to Fairmile. At the end of Hop Gardens we turn right into Crisp Road and head downhill to the t-junction at the end where we take the footpath diagonally left between a house and a bungalow. We follow the enclosed path which brings us out onto a recreation ground where we bear diagonally right to a main road, the A4130, with a sign opposite Fairmile left and Northfield End right. We cross the road turning left and take the footpath on the right sign posted Oxfordshire Way uphill to the woods. We follow the Oxfordshire Way through the woods coming out into deer parkland at a metal gate we keep heading uphill over No Man’s Hill to a very large tree with some seats made out of logs. We head forwards through the gate and follow the track past the big houses on our right until we come to a road. We take the footpath opposite still on the Oxfordshire Way through two fields and heading downhill through some trees to Middle Assendon. At the main B480 road and to the left of the Rainbow Inn we take a marked footpath, next to the telephone box, through a field steeply uphill going over a couple of stiles and between two rows of conifers to a road. We turn left and follow the road and when the road turns sharp right we head forwards over Bix Common towards the church. At the church we turn left to cross the main A4130 and take the small road opposite. We follow the road passing Bix Manor on the left and ignoring a footpath on the right and take the next footpath sign at Brawns House leading to Lawrence Farm. At the entrance to Lawrence Farm we turn right through a gate to cross a field to go through another gate into the wood. We turn left and follow the path now the Chiltern Way until we come to a crossroads of paths and a tree with a cross of white arrows on it. We head straight forward keeping to the Chiltern Way coming out at a field. We cross the field heading between two telegraph poles and then cross a tarmac farm road via two gates and then walk across the field and the next field heading towards the wood with a building on the left. We walk through the wood for a short way and when we come to a track and a pond in front of us we turn right over the footbridge. We carry on forward passing through a gate with Johnnie’s Gate inscribed on it and through a field. At the end of the field we pass through the car park at Grey’s Court and then turn right onto the tarmac track. We keep heading forwards past the beautiful buildings on the right and bear to the left when the track splits and then when the track turns to the left we head straight forwards on a path into the trees to go through a gate to meet a small road. We turn left onto the road and head forwards and then turn right at the t-junction with a give way sign. We head uphill slightly then at the next junction we take the road straight ahead and turn left at the sign post for Henley 2½ miles. We follow the path dropping downhill and then bearing right until we come out into an open field and keep heading forward going over a stile into another field and keep heading forwards between two fences along the valley bottom. We come to a stile and cross straight over the track through the gate following the yellow arrow. We now walk between the hedge on our left and fence on our right until we arrive back at the car park. This is an easy to moderate walk through fields, woods and parkland with a few small inclines and declines. Approx 7.75 miles allow 3 hours using OS Explorer map 171, Chiltern Hills West. Start point free car park on the edge of Henley College grounds at the end of Tilebarn Close off Deanfield Road. Henley-on-Thames is in South Oxfordshire. From the M40 take junction 4 the A404 to Marlow. At the roundabout turn right onto the A4155 and follow this road into Henley-on-Thames. The car park is on the edge of Henley College grounds at the end of Tilebarn Close off Deanfield Road and is free parking. There are public toilets in Henley at Mill Meadows and park, Greys Road and Kings Road car parks all with disabled facilities (RADAR keys) and the latter has baby changing facilities and also in the Station. For refreshments there are many shops, cafes, pubs and restaurants to choose from in Henley and there is the Rainbow Inn in Middle Assendon but the Fox Inn in Bix has closed. comment, until now. Excellent article. I took pleasure in reading it.